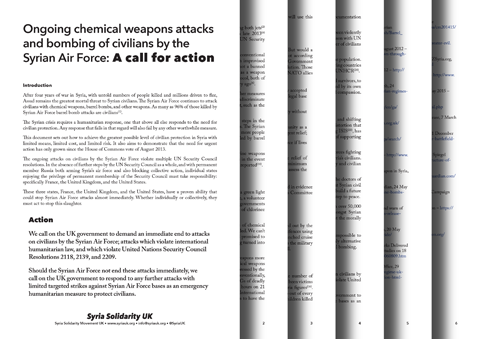 Read more at the Syria Solidarity UK site. 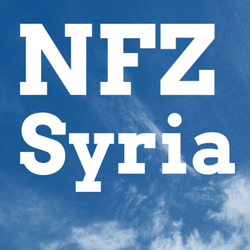 The Violations Documentation Center in Syria now lists 29,003 civilians killed since the 29 August 2013 UK Parliament vote against intervention. This total includes 379 civilians killed by rebels listed under ‘Regime’ casualties. 28,624 are listed under ‘Martyrs’, a figure which includes 254 killed by US-led Coalition air strikes, leaving 28,370 civilians killed by the regime or others. If the VDC figure for civilians killed since the 2013 vote were found to be an undercount to the same degree, then the actual figure would be over 50,000 civilians killed since the UK Parliament rejected intervention. 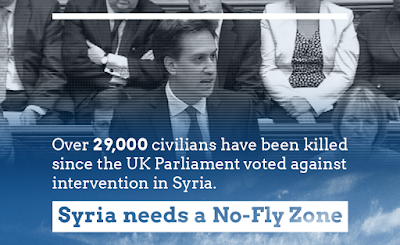 Amongst the 29,003 civilians that VDC Syria have confirmed as killed since the UK vote are 11,029 people killed by air attacks. 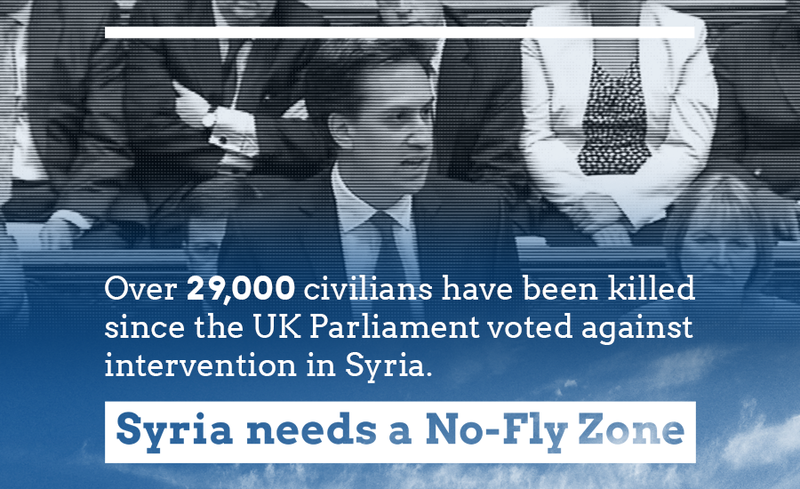 254 of them were killed by US-led strikes, and 10,775 were killed by Assad’s air force. 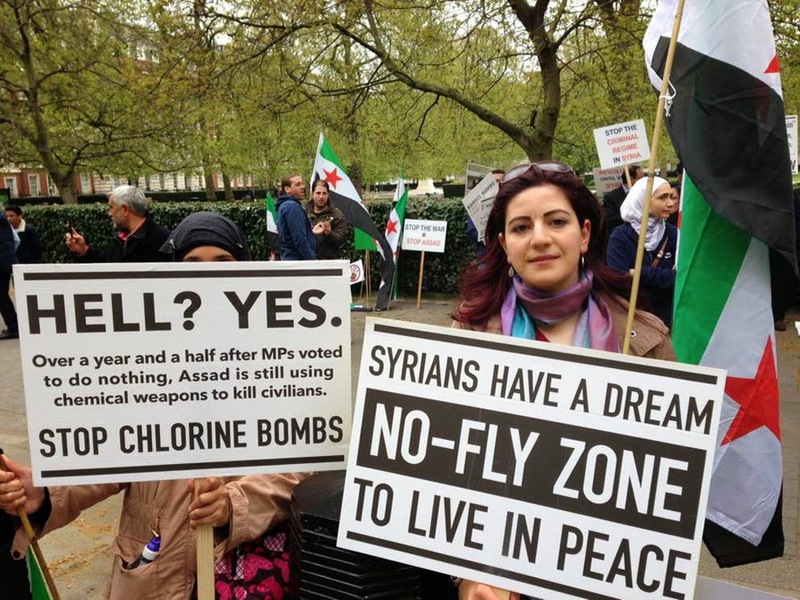 That means at least 37% of all civilians confirmed killed since the vote could have been saved had a No-Fly Zone been enforced against Assad’s air force. Again, the confirmed number is certainly an undercount, possibly by thousands. Amongst women the proportion killed by air attacks is higher: over 45% of adult women civilians confirmed killed since the 2013 Parliamentary vote against action were killed by regime air attacks. In 2014 the proportion rose: over 50% of women confirmed killed in 2014 were killed by regime air attacks. 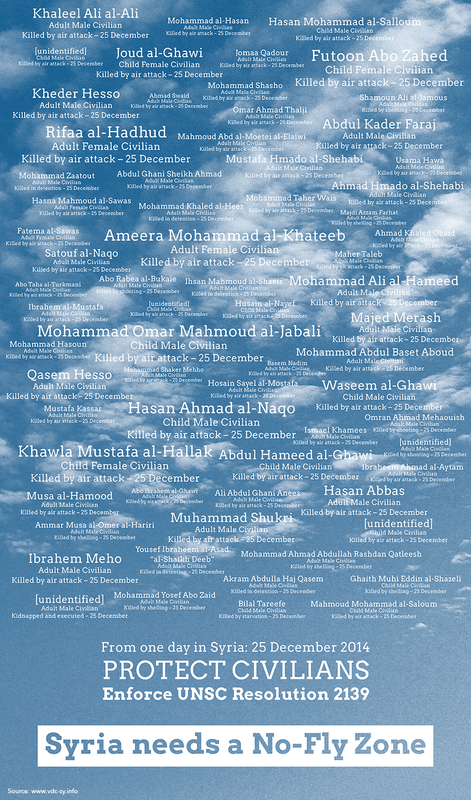 So far in 2015, over 51% of women confirmed killed have been killed by regime air attacks. Amongst children killed, over 49% of boys confirmed killed since the 2013 vote were killed by regime air attacks. Over 53% of girls killed were killed by regime air attacks. Again, the proportion rose in 2014. And so far in 2015 it is higher still: 56% of boys confirmed killed since the start of this year were killed by regime air attacks, and over 55% of girls killed since the start of the year were killed by regime air attacks. Air attacks by the regime are a key driver of refugee flows: see Barrel Bombs and the Regime’s Strategy of Urban Warfare by Ryan O’Farrell, and the March 2014 Human Rights Watch report, Unlawful Air Attacks Terrorize Aleppo. As with confirmed figures for violent deaths, UNHCR numbers for registered refugees are also necessarily lower than the actual number of people to have fled Syria. When the UK Parliament debated intervention on the 29th of August 2013 the number of registered Syrian refugees in the region was 1,830,557. The current number of registered Syrian refugees is 3,977,538, well over twice as many as when Parliament voted. Those numbers don’t include Syrian refugees outside the Middle East and North Africa. 222,225 Syrians sought asylum in Europe from April 2011 to the end of 2014.